Air travel can be an exhausting experience, both mentally and physically, but here are some tips that can lead to a stress-free experience. You have a smart phone. You know friends that have used these apps successfully. So what are you waiting for? Most of the major airlines allow you to “print” a scan-able digital copy of your boarding pass. It’s easy to do the night before, and can save up to an hour or more by bypassing ticketing lines. If using an iPhone, you can even save your pass to your phone, where it’s a simple click away via the Passbook and saved to your lock screen. Higher altitudes can take a toll on your body, so be proactive. Keeping your body hydrated will fight off exhaustion and keep you more alert. Whether buying a bottle of water after security or asking the flight attendant for juice in your airplane cup holder, have the energy you need to get work done in-flight and once you step off the plane. Taking your laptop or tablet out of your carry-on is a hassle. Even though you may not know it, certain companies have fulfilled your need to avoid this issue. With the quick unzip of a zipper, these butterfly bags allow your laptop, or other personal electronic, to lay flat on the scanning belt in a compartment all its own. No need to fuss with the dirty plastic bins. Sudoku. Crosswords puzzles. Word searches. Whether digital or old fashioned paper, keeping your mind active is not only a great way to pass the time, but good stimulation during the flight also. Forcing the mind to grow helps keep you alert, which is crucial when navigating air travel. This one takes a bit of gusto, but by being polite yet direct, you can save time by eliminating issues that usually fall to flight attendants. As more and more travelers turn to carry-on luggage to avoid luggage fees, it’s important to maximize the overhead space. Those that get on first aren’t always considerate of their fellow passengers, so help them be. Repositioning a suitcase, asking someone to hold their jacket, etc. 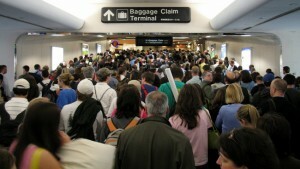 can be minor inconveniences that avoid trouble later and ensure on-time departures. The same goes for asking passengers to turn off cell phones, stow tray tables, return seat backs, etc. Since everyone wants to arrive on time, asking for courtesy from fellow passengers is in the flight’s best interest. Lastly, even with some of these tips saving you time, allow a big enough window for air travel. Arriving early is never a bad idea, so you’re not that crazy traveler griping in the security line, or trying to set a 5 minute mile pace to your gate. Remember, stay positive and be alert. By employing some of these tricks you may even enjoy yourself that next jaunt through the sky. PreviousPrevious post:Win a FREE Insulated Travel Mug!NextNext post:Our Cup Holder, Now PRIME Eligible!